Hatfield’s | Have YOU Ben Starr Struck? Please also note that, since we’re down to 6 contestants, each one of them has their own website (except for Josh). So instead of linking to social media pages, when you see a clickable name, it’s going to their individual websites, which are incredible places for photos, recipes, personal information, etc. So VISIT THEM! After a long hiatus due to the Olympics, MasterChef is finally back for one episode per week (Tuesdays) until a MasterChef is crowned. (Er…trophied.) And in today’s challenge we’re seeing exactly replicas of challenges from season 2. The group challenge is 3 against 3 in a Michelin-starred restaurant: Hatfield’s. Before I recap what happens in this season, I have to mention that in my season when we did our group challenge at the Michelin-starred Patina, it was one of the biggest epiphanies of my life. I realized that being a restaurant chef is actually my deepest, darkest, most terrifying nightmare, and that if I was ever so unfortunate as to be employed as a restaurant chef, I don’t know how long I’d last before ending it all on the point of a very dull knife. There are 2 broad types of people who love to cook: those who thrill to the challenge of multiple orders coming together at the same instant and whizzing out the door and that’s the end of it/next order please, and those whose fascination actually begins when the food hits the table and what happens to the people when they get it. And it was never clear to me in my mind that I don’t love cooking because I love to cook…I love cooking because of what food means to people, and how it brings them together. I’d rather be a highway construction worker in the middle of a Texas summer than be a restaurant chef. Because you never get to connect with the people you’re feeding. It’s only about the mathematical and artistic channels that result in a perfectly-presented plate of food at exactly the right time, and to me, that holds absolutely NO interest whatsoever. This is why FRANK is such a wonderful outlet for me. I get to cook alongside someone I really care about, Jennie Kelley. And then we put those plates of food down in front of the people who have come to dine with us, and we get to talk to them about it. And we get to see the magical way that food transforms perfect strangers into new best friends. This is another beef I have with restaurants. The vast majority use party seating…you arrive at the restaurant with your party, and your party sits at a table, insulated from everyone else dining. Ever craned your neck toward the next table to see what they were eating? Ever wanted to ASK them how it was, but felt it was a breach of tact? I hate that. I want to sit next to everyone at the restaurant, talk about the food, and talk about life. Make new friends. So the conventional restaurant world is most certainly NOT for me. Nor is Hatfield’s, the restaurant where this group challenge will take place. Hatfield’s is the kind of restaurant that will allow you to bring your own wine if you wish (as EVERY restaurant should), but will charge you $30 for the 30 second task of opening the bottle for you. (That’s just highway robbery, folks.) I realize that restaurants have an overhead, and that the 300% markup on wine is one of the ways they pay their bills…but a $30 corkage fee? Come on. Frank’s first pick is David Martinez, which is also a surprise for most of us. However, if you’ve read my previous blogs, you know that David is actually a BRILLIANT cook, and that’s clear to anyone who spends 10 minutes talking food with him…he’s just been struggling under the competitive format of the show. Frank knows exactly how knowledgeable and skills David is, and it’s proof to the audience that the David you’ve seen thus far in MasterChef is NOT the real David that his fellow competitors know. Becky’s final choice is Monti, which means Josh goes to Frank, leading to girls-against-boys in the kitchen! FASCINATING! I was a bit surprised that Becky picked Monti, since she has been somewhat disparaging about Monti’s skills throughout the competition. But it’s a fabulous team. If I were picking teams, I’d have put Monti, David, and Christine on a team, because I think they all have a very tight dynamic that complements each other, and Frank, Becky, and Josh on a team. You’ve probably got a bit more skill and refinement in the Frank/Becky/Josh team, but you’ve also got some leadership issues since everyone will be eager to lead. I think that would be an intriguing challenge to watch. So it’s boys-against-girls, and the contestants head back into the kitchen where the chef-owners (the Hatfields) are going to demonstrate how to make 2 appetizers and 2 entrees. Season 3 got off easy…in season 2 we had to do all that, and in addition we had to conceptualize and prepare from scratch a dessert, as well, all in the same prep time! The courses are much more interesting this season. (I didn’t care for the electric green risotto, the weird scallops, etc. from last season.) This season the appetizers are a croque madam with butter-fried bread, hamachi (the Japanese word for yellowtail) and thick-cut prosciutto, topped with a quail egg; and a handmade agnolotti (a stuffed pasta like ravioli) stuffed with ricotta and peas, sauteed in butter. The entrees are baked branzino (European sea bass) topped with fried capers and parsley, dried apricots, and roasted almonds, on a bed of green beans with celery root puree. (If you’ve never had celery root, or celeriac, you gotta try it, it’s incredible!) And a double venison chop which they don’t describe, but which appears to sit atop Brussels sprouts, turnip puree, and perhaps a beet puree, finished with red wine sauce and radish sprouts. The teams have 2 hours to prep, and we’re immediately led to believe that Monti has lost her hearing because she has to ask Becky to speak louder. Keep in mind that you are hearing the direct feed recorded from the contestant’s microphones…a commercial kitchen is DEAFENINGLY loud, with industrial vents roaring like jet engines, convection ovens that sound like vacuum cleaners, dishes clanking, line cooks hollering to coordinate. The sound team for the show has to work very hard to be able to isolate just the voices of the contestants. So it’s not weird for Monti to have trouble hearing. Christine’s hearing is probably a bit more acute than yours and mine, anyway. While Frank’s team seems to be leading in terms of prep, as the dinner guests start to arrive, things break down and a plastic oil bottle melts onto the flat top, and the beurre blanc (white wine butter sauce) is boiling, unattended. The narrator is careful to tell us right after this that the judges will make the final decision about which team wins based on who has the most impressive performance. And while they will take feedback from the diners and chef/owners into account, ultimately they will have the final say. To me, this immediately indicates that the girls are going to win, but that things will take another turn or two before that happens. I certainly expect the girls to win, because I don’t think the show is ready to dump any of the 3 girls, whereas they’ve been prepping both Josh and David to leave for the last few episodes. Service begins and we get a glimpse into the bizarre world of the restaurant kitchen. The “expediter” (in this case, Gordon), receives orders typed into the computer by the waiters, and he calls out the orders to each team. The team is supposed to respond by repeating the order to him to ensure that it’s correct, and then repeating the entire evening’s orders to each other so they’re all on the same page. I would never, ever be able to do this, I’m far too scatterbrained. In the Patina challenge last season, I basically stood there with my mouth open, staring around like an idiot, for the majority of the challenge, because none of it made any sense to me. It certainly wasn’t cooking that was going on…it was some bizarre ritual from another universe. The girls are leading the service with prompt appetizers, while the boys are struggling with the butter-fried bread portion of the croque madame. It’s really tough to deep-fry bread in butter perfectly…if the butter isn’t hot enough, the bread just gets soggy and butter-drenched. But butter burns and becomes bitter and acrid very quickly over high heat. So there’s a perfect balance that must be struck, and Josh is having trouble striking it. 30 minutes into service, the boys still don’t have any appetizers on the table, so Frank takes over the bread station. Then, to complicate matters, the VIP table where the chef/owners are sitting has requested both appetizers from both teams to be delivered at the same time, which means Frank and Becky have to coordinate their cooking. The girls are up to speed, but the boys need extra time, which means the girls’ appetizers will have to sit around getting cold (or over-cooked) while they wait for the boys. Then the boys’ appetizers are fresh and hot, while the girls’ have been sitting around for 15 minutes, when the dishes are delivered to the table…a stupendously unfair situation. The girls have a better agnolotti, while the boys have a better croque madame. When the main courses are tasted by the chef/owners, the boys win on both accounts…the girls didn’t have enough sauce on their Branzino, and their venison was overcooked. Finally, dinner service ends, and I know exactly how relieved the contestants are. Last season, I felt like I had given birth. Every cell in my body ached. I was drenched in sweat from the sweltering, humid kitchen. Burnt on both arms from the blasting heat of the flat top. Frazzled by how many dishes I had mindlessly and frantically churned out. Luckily, the judges poured us a bottle of Moet, which helped soothe us a bit. Back in the MasterChef kitchen, the judges make the announcement that, despite the fact that the boys’ dishes were better received by the chef/owners, the girls are actually the winners because their teamwork was smoother and more prompt. Joe apologizes to Christine for underestimating her. The girls head upstairs, while we wait for whatever twist the judges are going to throw at the boys. This IS a competition, folks. While I’d have never saved myself in a million years (mostly out of cowardice, not nobility), Frank is a brilliant, shrewd competitor and he made the smart decision to save himself. I know some people are gonna hate him for that, but Frank is so darn likeable, and I understand his decision…although I could never have made it myself. 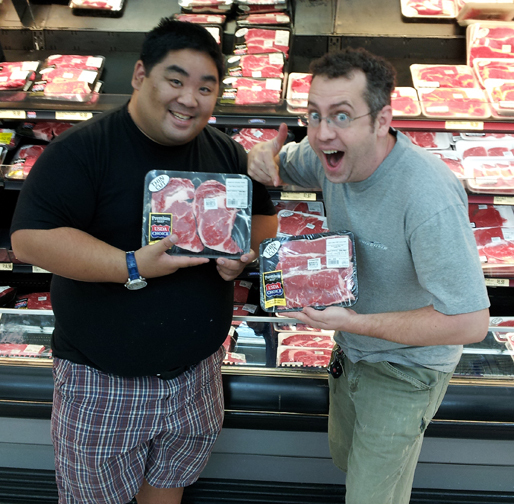 Lots of my fans commented on this photo and said that Walmart has the worst beef they’ve found in any grocery store. To be fair, Walmart has only recently chosen to start selling USDA Choice steaks, rather than USDA Select (the lowest quality you can normally find in the grocery store). So if you are one of those people, you probably haven’t yet experienced the new, higher-quality steaks, and Walmart has specifically chosen MasterChef as their venue to make this annoucement. So…there are now BETTER steaks at Walmart. However, they also still carry their lower-grade Select quality, as well. And they are really hyping this idea that “Now Walmart sells the best beef in America” when you can get USDA Choice steaks at any grocery store in the country. Beef quality is graded by the USDA based upon the amount of intramuscular fat found distributed throughout the meat fibers, called “marbling.” The more fat, the more tender, juicy, and delicious the steak will be, and thus, the higher grade and the most expensive. In the photo above, you can see liberal veins of fat running through the steak on the right…this is excellent marbling. The steak on the left doesn’t look very appealing to me, I would not buy it. Seriously, you probably have more choices than you realize when it comes to beef. Check out your farmer’s markets, and get on Craigslist. You and your neighbors might be able to go in on half of a local, grass-fed cow, have it processed and delivered right to your door, for LESS than the price of buying the same thing at Walmart’s already-low prices. Your money stays in the community, you get a vastly superior product for less out-of-pocket expense, and the animal you are eating led a much better life. You just might need to get a cheap chest freezer for your garage, because you’re getting 100 pounds of beef delivered! The pressure is on, and I get super excited when I see each contestant has 3 cast iron skillets on the stove in front of them! Cast iron is the ONLY WAY TO COOK STEAK. Indoors, at least. Charcoal grilling is lovely outside when weather permits. Please don’t ever, ever cook a steak on a propane grill, there’s no point. It’s comparatively uneven heat with no flavor benefit. Cook it inside on cast iron where the entire surface of the meat gets in contact with the searing hot cooking surface, or put a cast iron griddle on your propane grill outside. The trickiest steak to cook for David and Josh is, obviously, the well-done steak. Here’s how I cook a well-done steak, though I always have to cook it against my will: liberally season the steak with lots of kosher salt, plus garlic powder and coarsely cracked black pepper, and let it sit in a bowl on the countertop for an hour. Juices will run out into the bowl. Keep them. On a screaming hot cast iron skillet, give the steak a pre-sear in olive oil for 1 minute per side. Then place the skillet into a 400F oven, tenting the steak loosely with foil to retain moisture. Flip the steak gently every 5 minutes until it has the right feel to it. (Take your left hand, unless you’re a leftie in which case use your right, and hold your ring fingertip to the tip of your thumb. Feel the pad of muscle at the base of your thumb. That is the FINAL texture for a medium well steak. But by the time we’re finished with this steak, it will be well done.) Remove the steak from the oven. Rub some freshly chopped garlic and fresh thyme on both sides of the steak, and drop it into another screaming hot cast iron skillet with some olive oil and a bit of butter, along with the juices that ran out of the meat when it was resting before cooking. Sear it for 2 minutes per side. Then remove it to a cooling rack, place a pat of butter on top, and tent it VERY lightly with foil so that it can breathe and the crust you built doesn’t get soggy, and let it rest for 5 minutes. Return any juices that drop out to the top of the steak. Then serve it. I don’t know why anyone would ever wanna eat a well-done steak, but that’s how you do it. David makes a scary choice to cook his well-done steak entirely on the stovetop. This can result in a very dry steak. But knowing that there’s a good chance that the steaks will not be spot-on temperature for both contestants, the judges are careful to state that appropriate seasoning can make up for incorrect temperature. And tasting begins. David’s rare steak is medium rare, but has “aggressive garlic flavor” which Bastianich says might be difficult for someone to eat. (I don’t understand anything about that statement…in fact, I don’t know what “too much garlic” even means. I’ve never found that threshold.) Josh’s rare steak is spot on, and he pats himself on the back for it. David’s medium rare steak has an uneven sear and is just beyond medium temperature, but has great flavor and moisture, according to Graham. Josh’s medium rare has a flawless sear, but is medium in temp and lacking in flavor. Ramsay can tell from a gentle squeeze of both well-done steaks that both are undercooked. David’s is just over medium, with a perfect sear. Josh’s under medium, and seasoned nicely. At this point, you’d imagine that Josh is going home. Josh won the first steak. David won the second. Coming down to the well-done, David was closer to the temp than Josh, so he probably won the well-done by an inch. But the judges and producers have the final say, and Josh is staying, and David’s heading home. With grace, optimism, and dignity, and the same likeability that he had when we were first introduced to him months ago. Graham offers David a job in one of his restaurants, which further attests to the fact that we only rarely glimpsed David’s skill and vision on the show, but the judges saw it through-and-through. David flew home from MasterChef and immediately dove into the commercial kitchen. All that anxiety, fear, and frustration I experience in the commercial kitchen? David CRAVES it. In the few months since the show was filmed, he has interned (or “staged”) with many of Chicago’s top chefs…the kind of chefs that can run circles around Graham. David has done popup restaurants that have attracted a devout following among Chicago’s foodie culture, which is among the most robust in the world. He’s been invited to cook for the Bears and the Cubs and at international events hosted in the Windy City. As I type, David is completing a move to Phoenix, where he will work on his PhD in Education at Arizona State. His life’s second passion is educating underprivileged minorities, and he hopes to continue to work in both this vein, and in the kitchen, in the future. He has grand plans for his culinary future in Phoenix, and I was fortunate to be present when several of Phoenix’s movers-and-shakers in the restaurant world welcomed him to their city with open arms. I feel fortunate to call David Martinez my friend. We’ve spent barely over 48 hours together, but I feel like he’s an old friend. He and his wife B are amazing human beings, and I can’t wait to see David’s thumbprint on this country. Not only will he create culinary magic, many young aspiring minorities who could never hope to afford a higher education will be able to because of David’s efforts. Please follow David on Twitter, “like” him on Facebook, and visit his incredible blog, From Fire to Table. And please comment and share below!! !